Speculative Romance Author Regina Paul: Excerpt Wednesday: The Gatekeepers by David E. Barnett 404 ~ Page Not Found! Normally on Excerpt Wednesday I share an excerpt from one of my books. But this time I've decided to share an excerpt from a very close friend of mine who is a wonderful writer. Now a bit of a warning this is not a romance, but a fantasy. However, I know like myself that most readers read in more than one genre. This author brings this particular universe to life in a way that the characters just leap off the pages. I absolutely love this book and have read it three times now and have found something new to love about the book each time! In the ancient past a prophecy will reveal an unending evil that seeks to destroy all life. Humanity's only hope lies in the paws of a four-legged outcast with magical powers, a cat who has long sat at the feet of pharaohs, and who is the key to saving all life on Earth. But, will he have the strength to stand against such an evil power? 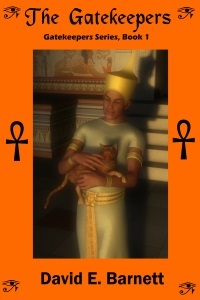 There is an oath that all feline kind has taken since our humble beginnings as pets to Egyptian pharaohs. That oath was that we would never allow our masters to come to harm from the deep and dark places that are apart from this world. If we did, our punishment would be that we would never be able to walk among humankind again. We would be banished to live in the forgotten sands of time, alone. Thankfully there have not been any that have failed in their duty. In today’s world while we sit upon the laps of the ones that love us, we are constantly vigilant, waiting for the day when the Sign of The Twelve is finally fulfilled. In that day, our service to our ancestors will finally be done and we will no longer have to worry about the Twelve Gates and whether or not they will open. We know that then it will be our duty then to seal off those gateways to the Dark Levels forever as our last and final act. That day has not yet come, but we know that one day that it will. When it does, we will be ready. What humans do not know about our kind, other than we are pets, is that we have a very structured hierarchy that has allowed us to prosper for so many centuries. When the Egyptian goddess of war and love Bastet sent us as a gift to man as a protector to him in ancient times, our way of life became much different than the way that it used to be. Instead of serving at the hand of our god-mother, we were bound by blood and honor to man because she had found them to be ignorant of the things that lay beyond. It was because of this ignorance that humanity is now in its current state. They go to war and destroy life. They cut down everything to build buildings and to further progress themselves in ways that we cats have no need or want of. When we were sent it was in the hopes that we would be able to change the mind and the heart of man, in an attempt to prevent them from destroying themselves. Unfortunately, we have failed. Instead, we sat at the feet of the kings and queens of ancient civilizations and were worshipped and revered as being the emissaries of Bastet, but not as the children of something that only wanted them to understand. The human race had been given their chance to change their ways, and it was now up to us to do what must be done. When man’s warlike nature began to prosper, a great many evils fell upon him that ended up destroying that which they had built. Plagues, great beasts, natural disasters, and other atrocities visited their doorsteps as we witnessed wondrous and miraculous things that were both ominous and terrifying. Then, we could not forget the Dark Ones; the entities that often corrupted men’s souls and made them do unspeakable acts and barbarous fits of violence. Things such as slavery, murder, greed, and arrogance plagued them at every turn by the sheer will of the Dark Ones. Soon, they began to flourish and dwell within the very hearts and souls of men who had allowed them free passage within their kingdoms. I know of this because my master almost became one of them. It has been many years now since I have seen my home and those who love me. I have left behind a mate, my sons and daughters, and my kin because my calling has bade me to do when I first began my mission. You see, we Gatekeepers are not attached to one master but many. Whenever we are called by what we call ‘The Great Heart’, we are bonded to that particular person until their light ceases to be and it is their time to pass through into the next life. Then, once our duty there is performed, we wait yet again for the same calling to our new master and therefore begin the process once again. What we do, we do not only for duty and honor, but also out of great love. You see, we have always loved your kind. We see the possibility of greatness within your people to do what is right rather than fall into the darker and more negative emotions. We have seen great leaders come forth from you that fought against the greater evils of your time. We have watched men and women fight for equality in race and gender. We have seen you struggle to find new medicine and cures to heal the sick and wounded on and off the battlefield. We have also seen your capacity for love even in a world where hate and indifference rule supreme. It is because of r these things that we have been allowed to remain among you. But, as always, when you have a great deal of time on your hands, you find that you sometimes can run out of things to do. It has been very quiet since the last incident ,thankfully, since the last time had been bad enough to deal with. We lost many numbers in that battle, but they were deaths that were not in vain. They met their end with their heads held high, and their tails swishing back and forth. They knew what had to be done, and it is because of those very deeds that I make time every day to write about them so that our future generations are never allowed to forget their heritage. They will know that one day; they may have to put their lives on the line to save those that they love. We die willingly, and will do so until the end of time. As I look down at my neck, I see the simple golden key that lay around it, given to me by my own father shortly before he died. He was the Gatekeeper of The Twelfth Gate in that time, which is the most prestigious and also the most dangerous gate of them all. The Twelfth Gate is the dimension where the worst of the Dark Ones are kept, locked away for all eternity in a world of smoke, fire, and heat for which there is no escape. My father was not only the keeper of the key, but also the warden of the dimension itself. Each gate is a dimension,, a prison where all Dark Ones are forced to enter once they have been sentenced and convicted of their crimes. Some of them are corporeal, while others may be human or animal in fleshly forms that have been converted by a Dark One at some time in their life. In any event once it happens, intentional or not, they become convicted felons in the eyes of the feline race and are therefore caught, tried, and sentenced to life imprisonment in one of the Gates. If they escape, they are not allowed to return and are then thereby destroyed by the Feline Council, who has the ability to pass the Final Judgment. I have witnessed such a ritual, and it is better by far to just stay where one is. It is late this eve, and I am finding that I cannot quiet my mind as memories of days long gone by fill it. I can still remember hot sand and the workers moving their feet back and forth in lakes of mud and straw as they made massive bricks to build monuments, obelisks and great structures called ‘pyramids’ for the glory of an empire that oppressed them. Being only a cat, there was nothing that I could do but sit and watch. But, one thing that I did know was that I could feel in the air that something was coming. I didn’t know what it was, but it was in those times that I knew there were great changes about to happen. David began writing short stories in middle school, and has retained the itch to write ever since. In 1988 and 1989, David was invited to the Oregon Young Writer's Symposium in Salem, OR for two stories that he had written. The first, The Days of the Green and the Gray, garnered special attention due its “descriptiveness of the times” as the story revolved around a young soldier's experiences with his unit during the Vietnam War era. The second, a humorous story called The Test, dealt with a young Native American brave out to prove his manhood with very laughable results. In 2007 David was challenged to finish one of his unfinished books by a relative who even went so far as to give him a deadline. Out of this, the book A Silent Shadow was born. When David isn’t writing, he can be found reading a good book, playing a video game, or watching movies with his wife into the early morning hours.